Audix presented its annual awards for best independent representative firm, dealer, and distributor at its annual sales meeting, which was held during the 2017 NAMM show in Anaheim, CA. 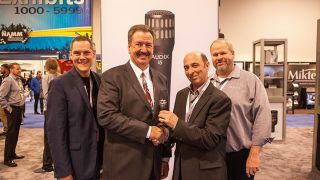 (Left to Right): Chriss Doss; Sweetwater president Chuck Surack; Cliff Castle; and Todd Brushwyler, Audix national sales manager. The awards were presented to those partners whose performance in 2016 met territory sales targets, demonstrated sales growth, showed consistency in sales throughout the year, increased new or reactivated existing accounts, and elevated the Audix brand within their territory through marketing and sales initiatives.